That’s the perspective of Don Snow, operations manager at CS Tool Engineering, who was honored as the 2014 AMBA Mold Builder of the Year for his efforts in bringing youth to the tool and die trade. Snow knows that since the economic recovery, things have changed. There’s a demand for both the people and technologies that can make this work more efficient. 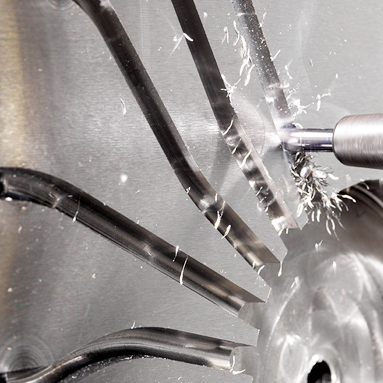 Being able to combine the two is key to success in this new machining world. 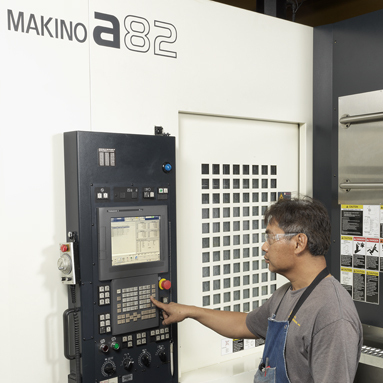 Snow makes a point to stay up on high-performance machining technology, such as the company’s new Makino a82 horizontal machining center, which has expanded its capabilities and reduced cycle times by one-third while cutting setup times in half. But, like many businesses, CS Tool also needs qualified people. 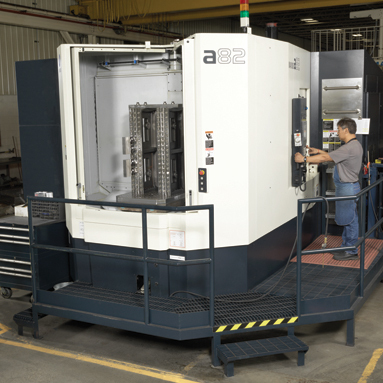 CS Tool’s investment in an a82 horizontal machining center helped the company employ production machining practices in its own mold-making processes to improve workflow flexibility and throughput. 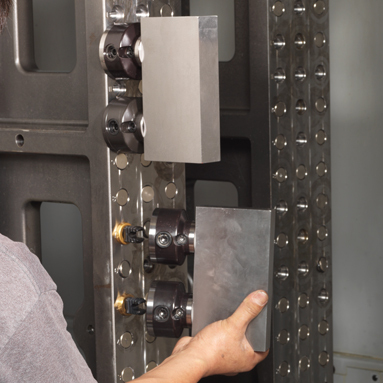 By integrating an FCS modular clamping system into its setup processes, CS Tool has been able to reduce setup times and improve workpiece positioning repeatability. The combination of the a82 and FCS has led to a 33 percent average reduction in cycle times and 50 percent decrease in setups. Purchased in 2003 as CS Tool’s first HMC, the MCC2013 is still as accurate today as when it was first delivered. Thanks to Don Snow and other leaders at CS Tool, the company has become recognized and respected in the industry for its efforts in improving youth education in the field of manufacturing. The a82 pallet changer has enabled CS Tool to improve workflow by pausing and switching out long runtime jobs in order to produce or modify a short run order with engineering changes. CS Tool is known for its work as a Tier 2 supplier to the automotive industry. The company, located in Cedar Springs, Mich., got its start in 1967, founded by brothers Tom and Don Mabie. In early years, it made molds for smaller automotive parts, like hood ornaments, garnish trim and lamp bezels, and it was soon also producing the molds for “Star Wars” characters for Kenner Toys. By 1981, CS Tool began a relationship with a major Tier 1 automotive supplier that still endures to this day. This work really helped it gain a foothold in the automotive industry via making molds for auto interiors and overhead consoles. 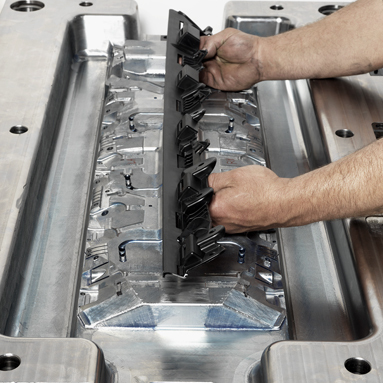 Today producing plastic injection and compression molds for automotive interiors remains the company’s specialty for its Tier 1 customers, but it also continues to produce molds for various consumer products. Over the years, the company has always updated technology to change with the times. In 1980, it purchased its first duplicator for electronic tracing, and then in 1982 obtained its first CNC equipment. The equipment upgrades continued until, like many businesses, the company went through the economic downturn that began in 2007. CS Tool managed to survive because it was not overextended in terms of credit, had loyal customers, and had a fast and precise machine to handle the P20 steel and Mold Max® alloy it works with. 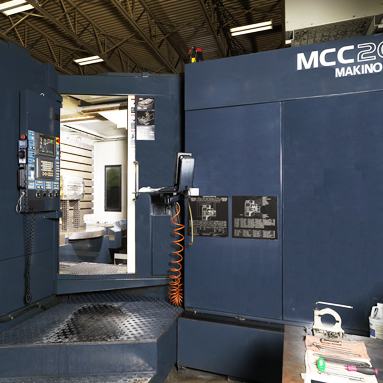 CS Tool had purchased a Makino MCC2013 horizontal machining center back in 2003 in order to efficiently handle a large workload of injection molded door panels and a floor console package. This machine made the company more competitive in its ability to handle large dies and molds—creating parts faster, reducing benching times dramatically and giving it the ability to promise better lead-times. CS Tool was pleased with the machine’s 4th-axis table that could handle large pockets and varying angles from the face, achieving fine finishes on tight corners and walls and reducing handwork. It helped the company meet its immediate and ongoing capacity demands while improving agility. In fact, on one mold in particular, its cycle time was cut in half with the MCC2013. So it was no surprise that by 2011, when mold manufacturing business was ramping back up and it was time to upgrade equipment, that obtaining another MCC2013 was top of mind for Snow. 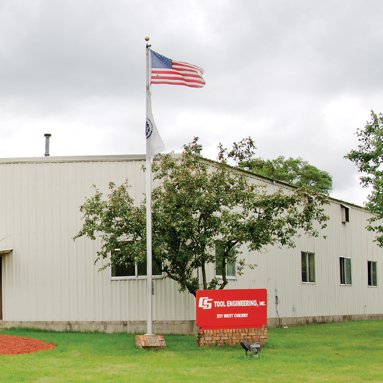 When he and his colleagues approached their contacts at SST, their local Makino distributor, the people at SST asked to come out and tour the CS Tool plant to determine requirements. What did surprise Snow, however, was that the SST representatives thought that Makino’s a-Series horizontal machines would be a better choice for CS Tool’s current and expanding needs. 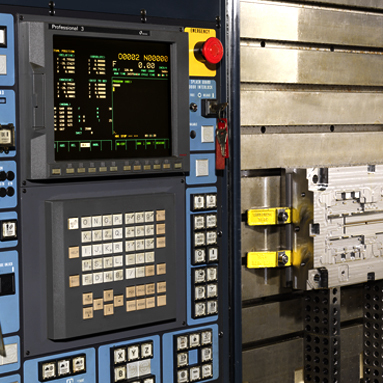 SST suggested that CS Tool purchase the Makino a82 horizontal machining center. This machine, for all intents and purposes, is a production machine tool most commonly used in automotive engine block production. 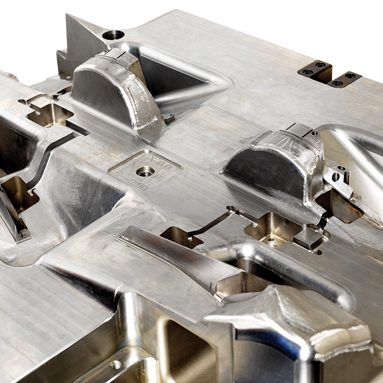 Snow was able to see that mold components can be machined with the same mentality as used in production machining, even when building custom components where only two pieces are alike. While investigating viability of the a82 at other mold shops, Snow also noticed a new modular clamping system being used at each of these facilities. Designed to provide quick, custom setup options for unrestricted access to five workpiece surfaces, the FCS clamping system (Breyl) enables mold makers to spend less time on setups and more time on machining. Its flexible and repeatable fixturing options are ideal for any type of workpiece, and it is advertised as turning hours of setup into minutes. FCS has an H-7 class fit with microlevel repeatability. The clamping body and workpiece are connected by a single rod. Where the rod interfaces with the workpiece, there are standard metric threads, typically M12 by 1.75 or M16 by 2.0. On the opposite end of the rod, a serrated feature fits into the clamping unit to fasten the workpiece securely to the base gage plate. When the final assembly is tightened, the tapers on the rings are guided into precise location. After visiting the other mold shops, CS Tool purchased the a82 in the summer of 2011. Snow hoped that it would help the company satisfy market demands, enhance customer service and become more efficient in both small and large mold manufacturing applications. 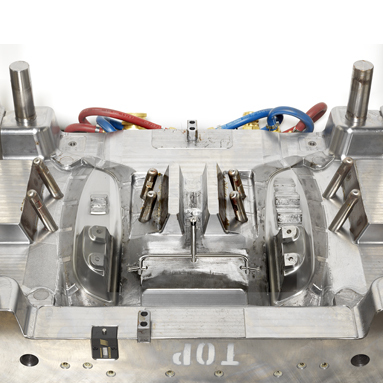 Having a machine with the appropriately sized work zone has brought CS Tool high efficiency in its goal to produce small molds as well as larger components. CS Tool appreciated the pallet changer on the a-Series machine so that the company would no longer lose time during work setup. The pallet changer lets operators load and unload work while another job is cutting. These capabilities also helped improve the company’s agility, enabling it to pause and switch jobs quickly. With the full 360-degree B-axis, CS Tool was now able to machine all five sides and angled holes efficiently. “The two-pallet system has helped our company improve utilization rates of the machines while also helping us become more agile in producing quick turnaround orders, such as engineering changes to previously produced molds,” said Snow. For example, CS Tool may be cutting a block with a long run time. Then, an engineering change comes in. The operator is able to load that block while the machine still cuts. Operators can pick a point to stop, or pause the long-run-time application mid-process. They can then switch out the job and do the short-run order, before swapping the original long-running job back in. This pallet-changing capability certainly saves a lot of time. But Snow had seen that even more potential was available. The FCS minimized setup even further because CS Tool no longer has to pick up and indicate the workpiece. The holes always are located in the block of steel to serve as permanent reference points to enable easy removal and reassembly of the workpiece on the pallet or base gages to keep the zero reference point locked in. This design facilitates engineering changes or part repair, and the original mounting holes enable quick re-clamping at the same point. Snow says that while CS Tool operators must take the initial time to drill and tap a hole and qualify the counter-bore, once that hole is made, the FCS follows jobs through engineering changes, production and repairs. What CS Tool has found is that it has reduced its setup time considerably and is more accurate in the tools it cuts. In addition, the company is able to produce custom FCS designs and fixtures in-house, using the accuracies of the machine. It is able to maintain precision hole location on the plates and build the FCS fixtures to match the pallets’ center of gravity. By producing custom FCS designs and fixtures in-house, CS Tool not only saves money but also gets the size that works best for its applications. The combination also helps with CS Tool’s lean efforts. Because the FCS and pallet changer yield more spindle time, operators can now run two to four machines each. “This is a powerful saving, since we can do multiple workpiece setup and run lights out,” said Snow. The accuracy of the machine, along with the precision work holding of FCS, has driven down costs and lead times at CS Tool by reducing spotting and benching operations. For example, CS Tool needs to cut a highly contoured parting line with three- to five-degree shutoffs to a minus thickness. Additionally, the tool must sit together but seal out without flash. This means CS Tool needs its machine tools, processes, cutting tools and tool holders to give the required accuracy. As far as the investment in the a82 and FCS system, CS Tool has found its ROI to be in the accuracy and uptime of the machine. It is seen in products such as the complex tooling the company does for its rearview mirror molds. “We respect the quality of the Makino machines,” said Snow. “Our MCC2013 is 11 years old and is still highly accurate as day one. Day after day, we go out there and run the machines without issues. We can’t afford downtime costs. Snow’s service on advisory committees for career tech centers and work with local colleges to bring up that next generation of workers into the tool and die trade helped bring him to the AMBA’s attention for the Mold Builder of the Year award. CS Tool is part of the Whitehall Township Tooling Coalition, which is an alliance of eight companies in Western Michigan. All companies in the coalition have the common need for attracting people into the trade and work together to do so. Snow also hosts an in house apprenticeship program at CS Tool. Part of CS Tool investing in its young workforce includes making the technology available that can take them through the future. This philosophy of treating people well carries over to the company’s relationships with peers. Relationships with customers are also crucial. Just as CS Tool’s peers shared its technology, the company has also shared its best practices with customers. In fact, one of the Tier 1 suppliers that CS Tool works with purchased an a82 machine after seeing CS Tool’s success with it. Employees at CS Tool also work as a team to provide excellent service to customers, especially as customer requirements change. This capability, along with a passion for customers and building the tool and die trade, has brought award-winning results to CS Tool.